Saturday 10th March saw nearly 500 athletes take on the re-scheduled SSE Airtricity 10 mile road race in Londonderry. Although considerably better than last week’s weather, conditions were far from ideal as competitors faced a cold biting wind and an icy drizzle that developed into persistent rain as the race progressed. In the ladies race, Caitriona Jennings (Letterkenny AC) controlled the race throughout winning in a time of 59.13. Karen Alexander (Acorns AC), on her return to competitive racing finished second in 1.02.40, while Gemma McDonald (Ballycastle Runners AC) finished third in 1.05.40. Springwell RC was well represented at the event with a number of age category podium finishes. Karen McLaughlin had another great performance finishing 52nd in 1.09.01 to win the F45 category. David McGaffin was 46th in 1.08.03 as 2nd M50, Kerrie McIlmoyle was 68th in 1.10.16 as 3rd F35, Pamela Howe finished 196th in 1.22.04 as 3rd F50 and Elizabeth Deighan ran 1.25.20 to finish 233rd and 3rd F55. The Glenariffe Mountain Run, hosted by Glens Runners, even in good conditions, is a challenge. When you add fog, driving rain and freezing temperatures it becomes an event for only the toughest of competitors. 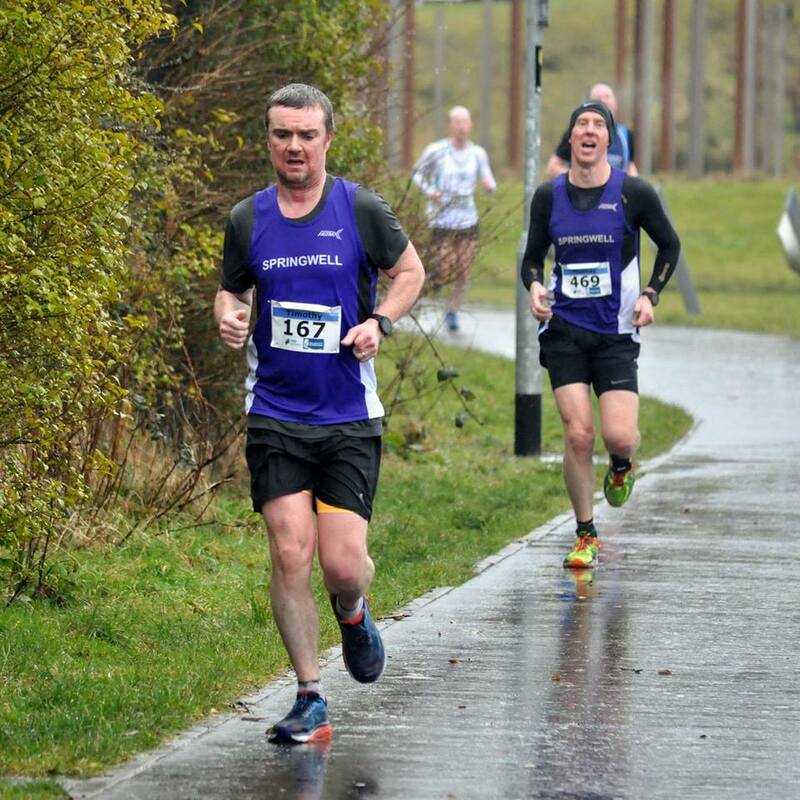 Such were the conditions on Saturday 10th March, in the Glens of Antrim as 140 runners took on the challenge of the weather on the day, and a water logged course that had been turned into heavy clinging mud from the previous week’s rain and snow. Two miles of stamina sapping running on water logged ground brought the runners to the start of the mile climb up the side of the Glen over grassy tussocks and slippery boulders. The descent wasn’t much easier as the underfoot conditions tested runners nerves as they tried to keep their footing before they faced another two miles of strength sapping mud running, made all the harder after the punishing climb and descent, on their way back to the finish. It was to be no surprise that the Kingdom of Mourne featured heavily in the results. In the mens race it was Seamus Lynch (Newcastle AC) who won in 43.49 with William McKee (Mourne Runners) second in a time of 45.04 and Zak Hanna (Newcastle AC) third in 45.28. In the ladies race Esther Dickson (Newry AC) won in 52.47 with Matsje Hell (North Belfast Harriers) second with 53.25 and Sarah Graham (Mourne Runners) completing the podium in 55.49. Springwell RC were represented by three of their mountain running specialists with an excellent run from Alex Brennan to finish 10th and 1st M40 with a time of 48.35. Oisin Brennan finished 15th in 51.36 while Molly Brennan crossed the line 69th in 1.05.10. Events management company, Atlas Running held a series of events at Shanes Castle in Antrim on Saturday 10th March. Organised on a 13.1 mile lap promoters offered competitors a choice of Half Marathon, Marathon or a three lap, 39.3 mile Ultra Marathon. In the Half Marathon event Springwell RC had three representatives with Elaine Montgomery 56th in 2.14.00, Deborah Archibald 58th in 2.14.14 and Catherine Byers 64th in 2.18.35. Representing their schools, seven of Springwell RC’s junior section travelled to Carriganore in County Waterford on Saturday 10th March for the Irish Schools Cross Country Championships at the WIT Arena. The weather of the previous number of weeks made for a very muddy course which deteriorated as the events progressed. Senior Girls (2500m) - Niamh Carr (Loreto College) 5th 10.38, Elle Beveridge (Coleraine Grammar) 35th 11.45, Rebekah Hunter (Coleraine Grammar) 46th 12.09.